JeeHae Ahn appeared on Show 213, recorded in February 2010, at age 18. 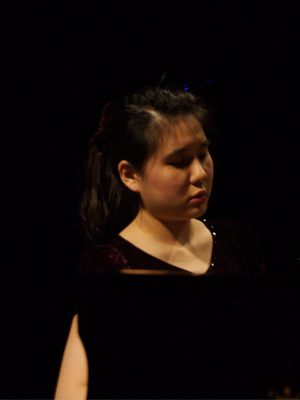 JeeHae Ahn (piano), 18, hails from Seoul, Korea but has come to the United States to study at the Walnut Hill School for the Arts in Natick, Massachusetts. She is a 2008 winner of the Boston Symphony Orchestra Concerto Competition where she performed the first movement of the Beethoven Piano Concerto No.3. JeeHae plays chamber music and sings in the choir at Walnut Hill. As the first member of her family to come to the U.S., she credits watching American TV as a child for her English language skills. JeeHae also loves traveling, reading, and writing letters to her friends and family in Korea. JeeHae is a Jack Kent Cooke Young Artist.